Baked Aubergine with Preserved Lemon and Yoghurt. I know I know.. another Aubergine dish! But I do love them! Another one from Olive magazine with a few tweaks that I felt it needed. This is great served as a lunch or a side dish. The recipe in the magazine uses a few strands of saffron to colour the yoghurt but I personally didn’t like the taste with saffron in so I have left that part out. 2 preserved lemons – 1 thinly sliced and 1 roughly chopped. 200ml thick yoghurt preferably Greek. 2 tbsp toasted cashew nuts. Heat the oven to 200 fan/180/Gas mark 6 and line a baking tray with greaseproof paper. Mix the Tamari/Soy Sauce, Honey and Sesame oil in a bowl. Lay the aubergine slices evenly on the tray and coat each one with some of the sauce mixture then bake for 20 minutes or until soft. Put the chopped preserved lemon with the yoghurt and a pinch of salt in a food processor and mix until smooth. Toast the cashew nuts in a dry frying pan for a few minutes. 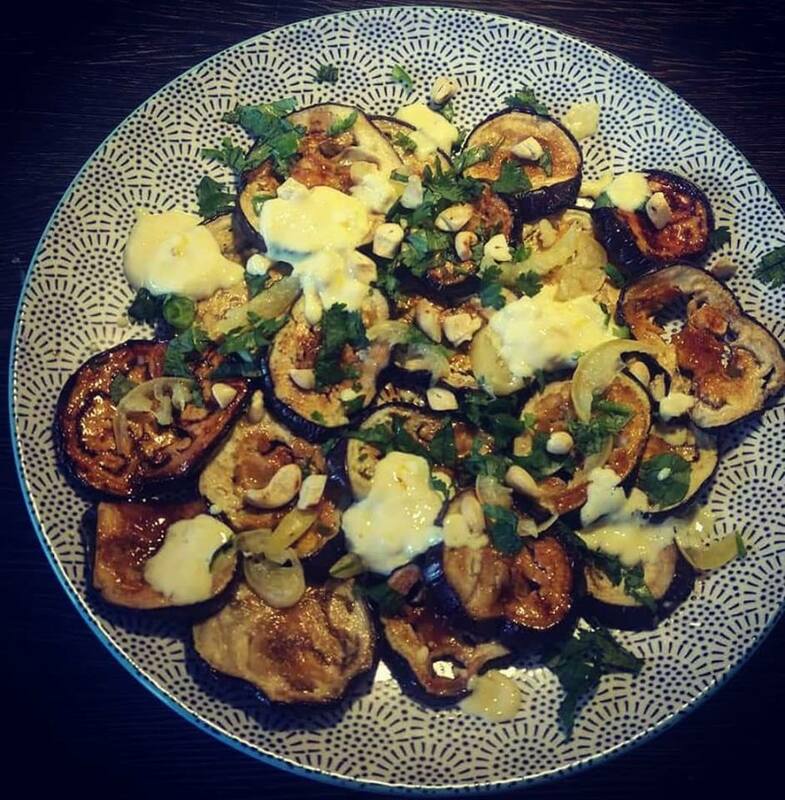 Arrange the cooked aubergine slices on a plate and scatter the corriander and mint leaves, red chilli slices, preserved lemon slices, cashews and drizzle with the dressing.